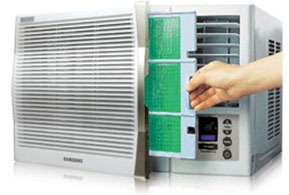 How to clean Air Filter for Samsung Window Air Conditioner? To ensure maximum cooling capacity and efficiency, you should keep the filter clean. During peak usage times the filter should be inspected on a weekly basis to make sure that it is not clogged with dust.